"Saving the lives of dogs, to enrich the lives of people"
What is a Hearing Dog? Hearing Dogs are specially trained to alert people who are deaf or hard of hearing to common household sounds such as door knocks, telephones, and smoke alarms. We provide Service Dogs trained for veterans diagnosed with PTSD. Other tasks we may train for include assistance with hearing loss, TBI (traumatic brain injury), and moderate physical limitations due to injury. Not all of our outstanding dogs can meet the demands of becoming a Certified Assistance Dog, thus the need for a "Career Change". They are, however, still winners, and make wonderful pets. "It is possible to conquer the past and create the future; the first step is choosing to take the journey." Hearing Dogs are specially trained to alert people who are deaf or hard of hearing to common household sounds such as door knocks, telephones, and smoke alarms. 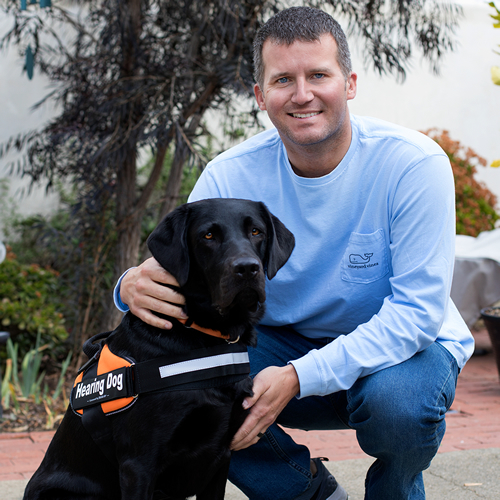 A Certified Hearing Dog may accompany someone deaf or hard of hearing into public places such as grocery stores and restaurants. In public situations, a Hearing Dog is providing environmental awareness by naturally paying attention to surrounding sounds. Note: “Certification” is a label we use to mean a dog that is specially trained for public by one of our trainers. It is not a term used by the ADA. 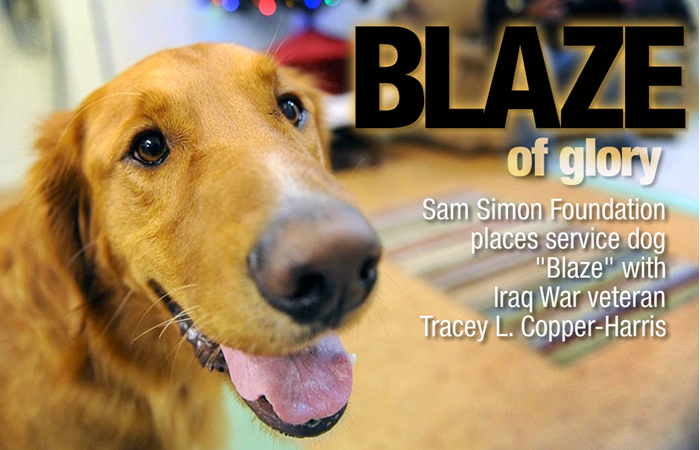 The Sam Simon Foundation launched its Service Dog program in response to the growing need of veterans coping with PTSD as a result of the Iraq/Afghanistan conflict. A Service Dog is not a cure for PTSD, but whose skills and companionship can be an aid for managing the symptoms and promoting well-being. Our dogs are specially selected from local shelters based on their temperament and breed. Most of our Service Dogs will be retrievers or retriever types. They are generally between 1-2 years old at the time of their placement. The Sam Simon Foundation rescues dogs from animal shelters and professionally trains them to become assistance dogs for people who are deaf or hard of hearing. This is part 1 of our video that describes our Hearing Dog Program. This is the second part of our video which describes our Hearing Dog training program. The Sam Simon Foundation rescues dogs from animal shelters and professionally trains them to become certified assistance dogs for people who are deaf or hard of hearing. We are a 501 C3 non-profit organization privately funded by The Sam Simon Foundation Giving Fund so we do not accept any public donations. WE OFFER THESE SERVICES FREE OF COST TO ALL RECIPIENTS OF OUR PROGRAMS.